My parents had no idea what it was all about. It turns out that my much older distant cousin was in town from overseas and was going to stop by on his way down to visit the relatives on the Eastern Shore of Maryland. What a way to make an entrance! As you can tell, it left a distinct impression on my young psyche. Add to that that cousin G was a dashing international man of mystery sort and well… . Since that time telegrams have disappeared. We all carry cell phones with international sim cards or something. More’s the pity. A telegram has impact. I just sent one to friends to congratulate them on the birth of their first child, Henry. It is my hope that it will go into his baby album to be explained in the waning days of the century to a new generation who will wonder at our primitive ways. A very elegant gesture in an era of instantaneous streamlined communications. This entry was posted in Elegantology and tagged Telegramstop.com. Bookmark the permalink. What fun. I really like the elegance of this. 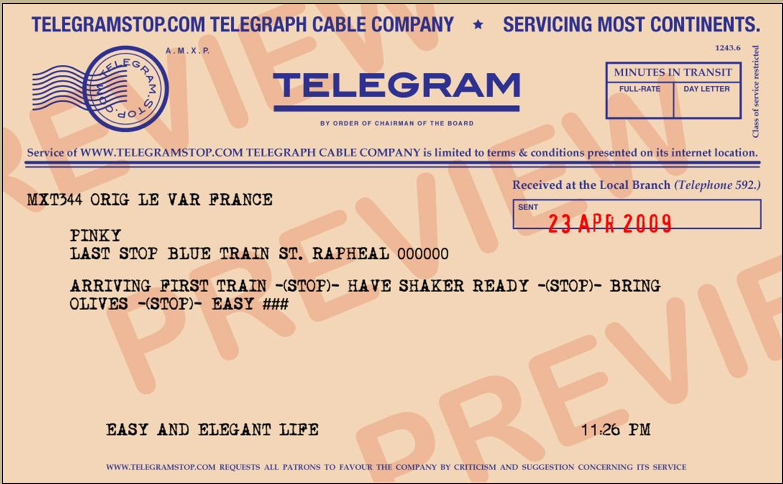 But, doesn’t it defeat the purpose that this service is mailing the telegram to be delivered in 4-8 days? I always thought the point of a telegram was that you could know when it would be delivered. I enjoyed the story of your cousin as well. Dear Anon, well yes. It does defeat the purpose a bit. But telegrams are no longer needed now that we all carry cell phones, and have email. Rates for a “real” telegram are running about $20 USD + a cost per letter. This is just for fun and will make for a nice keepsake. I’m off to get the baby gift engraved. Oh, that is marvelous and anyway much more fun that hideous Hallmark greeting cards! Good show, E! Very interesting! It would be so fun to send or to receive. When I was born (1965) my grandmother sent a telegram to my father who was in Viet Nam at the time. The APO put it on the mail drop and he received it two weeks later. He never fails to get a kick out of telling that story.